Following the posting of the Draft National Policy on Data Protection (2004) in November 2004, a second revised Draft National Policy on Data Protection was released by the Ministry of Public Administration and Information (MPAI) in September 2005. Establish a national Data Commissioner. This Policy and Bill recognise the need for a credible, expert and independent institutional infrastructure to advise the Government on the implementation of this Policy and Bill, as well as determine issues of compliance and redress. It recommends that a regulatory body be established in the form of a Data Commissioner whose role would be to hear appeals regarding access and correction of personal information held by public authorities and selected private sectors to which mandatory requirements would apply, and promote the purposes of the legislation through education, research, and co-operative activities. Read the Ministry announcement of the revised draft policy on Data Protection. Following the posting of the Draft National Policy on Electronic Transactions (2004) in November 2004, a second revised Draft National Policy on Electronic Transactions was released by the Ministry of Public Administration and Information (MPAI) in September 2005. Read the Ministry announcement of the revised draft policy on Electronic Transactions . Where: Engineering Consultants (ENCO), 112A Edward Street (corner of Oxford and Edward Street), Port of Spain. The Trinidad and Tobago Computer Society (TTCS) will be installing open source software for Windows such as those on the TTCS OSSWIN CD. The TTLUG will be installing several Linux distros: Fedora Core, Mandriva, Knoppix/Mepis/Morphix Light and for the brave, Gentoo, Slackware and other non-mainstream distros. The Trinidad and Tobago Computer Society (TTCS) conducted an e-mail interview with Patrick Hosein in April 2005, the administrator of the Trinidad and Tobago Network Information Centre (TTNIC). The TTNIC is responsible for the registration and administration of Internet domain names under the TT (Trinidad and Tobago) Top Level Domain. Examples of such domain names are those ending with .tt, .co.tt, .org.tt, .edu.tt, etc. The Government of Trinidad and Tobago has recently assumed control of the .gov.tt subdomain. 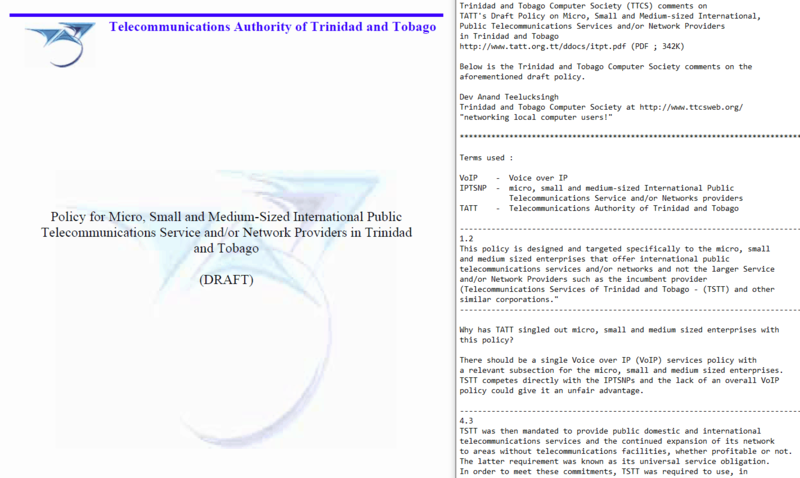 This article is about ADSL service offered by TSTT in Trinidad and Tobago. ADSL is an acronym for: Asymmetric Digital Subscriber Line. It provides faster Internet/data transfer speeds (as compared to speeds from 56K dial-up modems) over existing telephone lines. The local service is “asymmetric” because download speeds are faster than upload speeds. ADSL can provide reliable speeds as high as 256 kbits/s, but is limited by distance and the quality of available phone lines (good quality = high speed, bad quality e.g. “noise” on the line = slow speed, closer to the DSLAM-enabled telephone exchange = higher speeds, further away from the DSLAM-enabled telephone exchange = slower speeds).